2 lb 4.25 x 2.25 x 8" 4 lb 5 x 3 x 9.5" 6 lb 6 x 3.5 x 11" 12 lb 7 x 4.25 x 13.75"
12 lb. 100% Recycled Kraft Paper Gift Sacks by the 500 pack carton. Made of 35# recycled natural kraft paper. Papers used in this productc complies with FDA regulations for food packaging. Made in the USA. 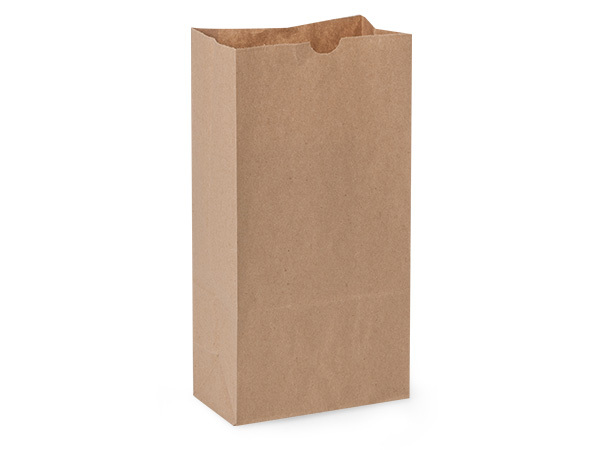 Kraft Gift Bags are stocked in white and recycled natural brown kraft. Bags have side pleats and flat bottom. The 100% Recycled Natural Kraft Paper Bags are sturdy 35 lb. paper. White Kraft paper weight varies. See each item for details. Complies with FDA regulations for food packaging and are made in the USA. Note: Sizes may vary slightly.